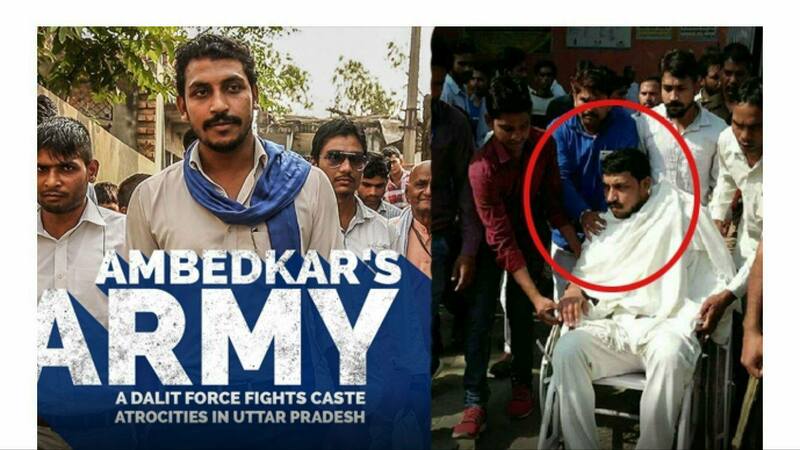 Chandrasekhar, also known as Ravan,30 was arrested in June 2017 in connection with the May 5 clashes in which one person was killed, and 16 others were injured at Shabbirpur village in Saharanpur, Uttar Pradesh. The Yogi Adityanath government in Uttar Pradesh has decided to revoke through dreaded National Security Act filed against Chandrasekhar Azad, the young and dynamic leader of the Bhim Army. Azad was booked under the NSA for Saharanpur violence in May 2017 and has been in jail since then. He was released early this morning at around 2.44 AM. The government denied that the decision on Azad’s premature release was taken to pre-empt any adverse order by Supreme Court, which the Bhim Army had approached two months ago. The Ambedkar Army or Bhim Army Bharat Ekta Mission or Bhim Army, also written as Bheem Army, is a Bahujan-rights organization in India. It was founded in 2014 by Chandrashekhar Azad and Vinay Ratan Singh for the development of Dalits, lower castes shudra and other marginalized sections of society. The organization is working for Dalit emancipation through education. It runs free schools for Dalits in western Uttar Pradesh. They now run more than 300 schools across Saharanpur. The Allahabad High Court granted him bail in November 2017 before the government detained him under the NSA. Officials said that the two others against whom the NSA was invoked in the case along with Chandrashekhar- Shiv Kumar and Sonu, would also be released. “Chandrashekhar’s NSA term was to end on November 1 this year, while the terms of Shiv Kumar and Sonu were to end on October 14,” said a government official. In a statement to the media, the police said, “Chandra Shekhar alias Ravan’s mother had submitted a plea. Keeping the current situation in mind, the government is taking a sympathetic view and is directing the Saharanpur administration to release him with immediate effect.” The Bhim Army founder had challenged his detention under the NSA in the Supreme Court after which the apex court recently issued a notice to the state government. There had been an incidence of trouble between the Dalit and Thakur Rajput communities on 20 April 2017 when the Dalits were celebrating the birth anniversary of B. R. Ambedkar. On 5 May 2017, a group of Rajputs entered into Dalit colony when they were on their way to a garlanding ceremony in honor of Maharana Pratap in spite of denial by administration to enter this colony and on this occasion the violence escalated, resulting in death of one Rajput, several injuries and the burning of as many as 25 Dalit houses. The Dalits claimed that the 20-25 strong Rajput group was an unauthorised procession. Security forces were subsequently deployed to monitor the locality. An attempt by Dalits to protest on 9 May in Gandhi Park against the troubles was denied permission by city authorities, leading to more violence as the people turned instead to the streets. It was alleged that the Dalit protestors set fire to a police base and various vehicles. Subsequently, on 22 May, around 5000 Dalits peacefully protested at Jantar Mantar, led by the Bhim Army. Organisers later claimed that the actual attendance was around 1500-2000 people. On the same day as the Jantar Mantar event, 180 families from Rupdi, Kapurpur, Ighri and Unali villages near Shabbirpur protested by immersing Hindu worshipping elements in a river and converting to Buddhism. They claimed that Hinduism did not give them equal status.